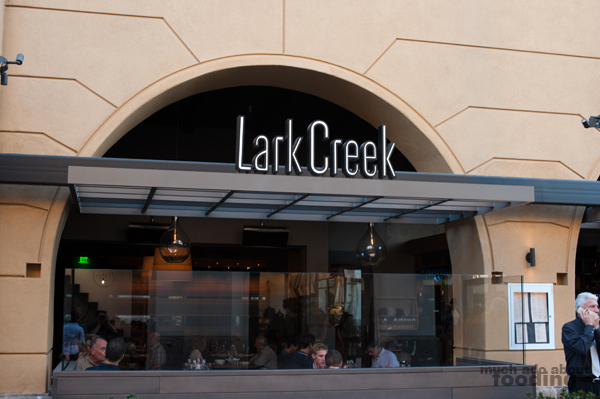 Everyone, please give a warm welcome to #14 in the Lark Creek Restaurant Group's portfolio of restaurants: Lark Creek Newport Beach! 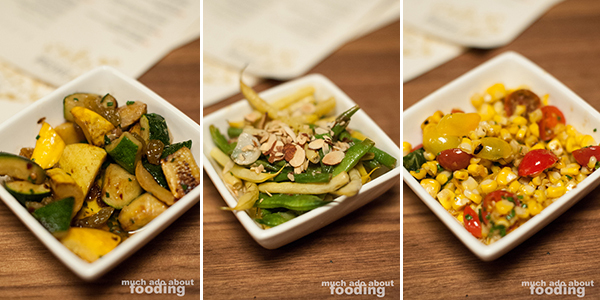 Housed in Fashion Island in a wing with other restaurants and visible from its corner placement, this farm fresh restaurant debuted just over a month ago to hungry Orange County residents. 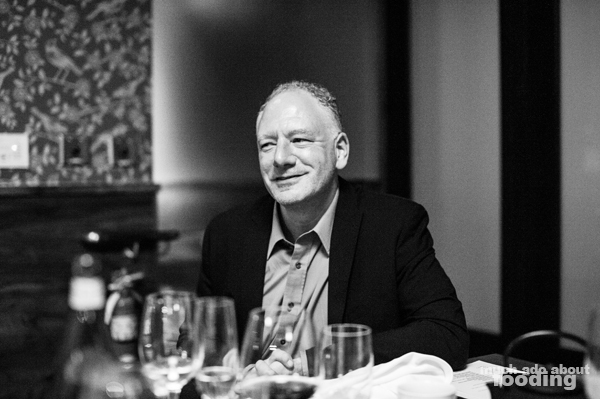 It is a pioneer for the company in the southern California region; the company's start in 1989 in the restaurant business through Lark Creek Inn began up north in Marin county and has only begun to trickle its way down south. Lark Creek Newport Beach joins the likes of Lark Creek Steak, Lark Creek Grill, and other like-named restaurants in providing the community with what it wants from food. 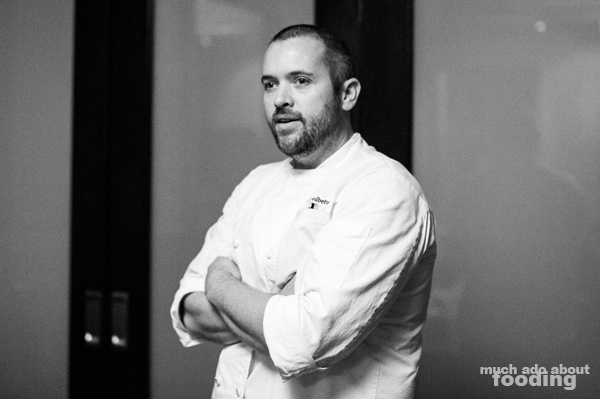 Each one is both chef and community driven, and we were invited to taste Partner/Chef John Ledbetter's fare on early September day along with meeting General Manager Chad Sisco. A unique trait we found at Lark Creek was its participation in SPE Certification as the program's first is West Coast partner. SPE stands for Sanitas Per Escam, Latin for "Health through Food." Through this certification process, menu items are analyzed to conform to a preset standard of nutritional goals such as fat, sodium, vitamin, and fiber content. Ingredients must also be properly sourced and handled to ensure that the most nutrition can be yielded per ingredient. We found that nearly 1/3rd of the menu at Lark Creek fit within SPE standards and that the food could easily have been placed on a restaurant's menu without needing a disclaimer (though it's always helpful to know that we're making healthy choices, right?). Our visit showed us an environment perfectly befitting of the Orange County crowd (they sure did their research) with an indoor-outdoor seating patio, seasonal and sustainable farm-fresh food, and craft cocktails. The room we sat in was perfect for private gatherings and featured a lark motif on the walls. Though their interior designer came from San Francisco, the planning and research that went into studying the Orange County culture as well as Fashion Island's frequenters shone through as the vibe of the place fit in well with the vibe of its people. Our first bites were slices of beautiful bread from OC Baking Company as we awaited our cocktails. Our poison(s) of choice were the Bon Vivant ($12 - Beefeater 24 Gin, grapefruit, lemon, rosemary simple, prosecco), Moscow Mule ($11 - Russian standard vodka, lime, ginger beer; keep the mug $20), and Unfashionable ($12 - Russells Reserve 10 year bourbon, Leopold tart cherry liqueur, lemon, orange). 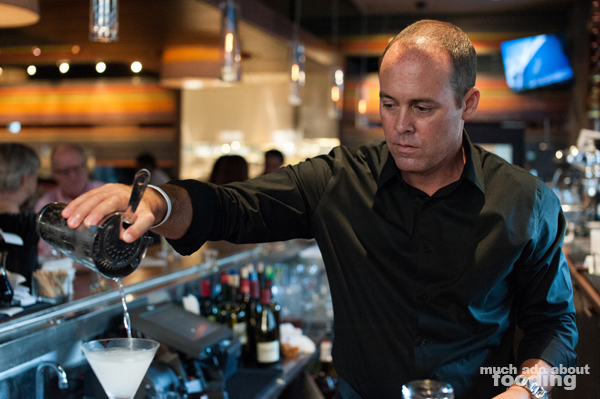 If you are looking for tasty cocktails, look to Lark Creek on your Fashion Island trip. As we awaited our food, we noticed that the wines being poured for the evening were a little off the beaten path. 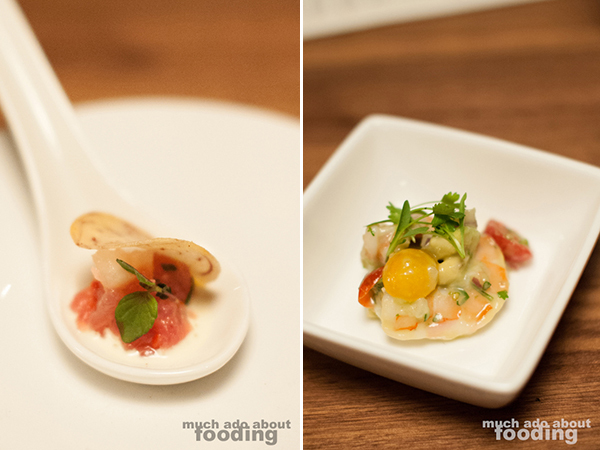 Our amuse bouche and following dishes were complemented by a light, vibrant 2009 Iron Horse Lark Creek cuvee to start. The amuse bouche was an ahi tuna tartare with Asian pear, shiso peppers, Australian finger limes, and a taro chip, presented delicately in a ceramic spoon for one fell swoop of a slurp. The Asian influences in such a bite combined together to give me a scent of what I thought was ginger but realized was the lime playing together with the pear. It was a good choice on Chef Ledbetter's behalf for a palate opener. Our first exposure to an SPE certified dish was his White Shrimp Ceviche (avocado, baby heirloom tomatoes, cilantro, habanero, and lime), recently broadcast on television in a how-to segment. The seemingly small morsel of a single coated shrimp proved to be a proper tasting size in its meatiness and thick tossing. The habanero certainly lent a welcome kick to the otherwise citrus-y dish, and we found that it was most of the group's favorite (with good reason!). 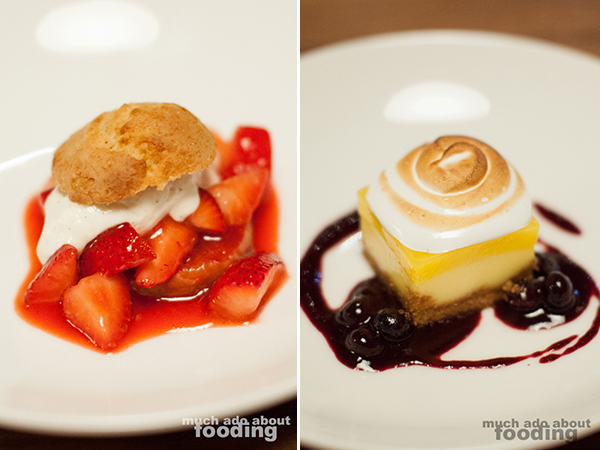 This was served alongside a glass of 2012 Illumination Sauvignon Blanc from California. 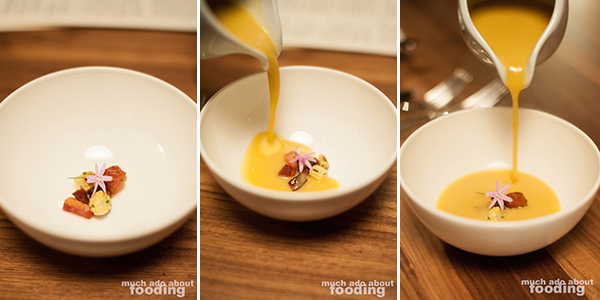 Prior to our ceviche were beautifully presented bowls of Puree of Corn Soup (charred baby corn, bacon lardons, and chives), a tableside-service dish showcasing a neat microarrangement of bites that were swiftly flooded with a creamy, sweet puree. I especially enjoyed this dish for its fun interactive nature, the brief moment of panic I felt when I hoped my baby of a flower would not drown in corn, and the combination of crunch, salt, and natural sweetness per spoonful. 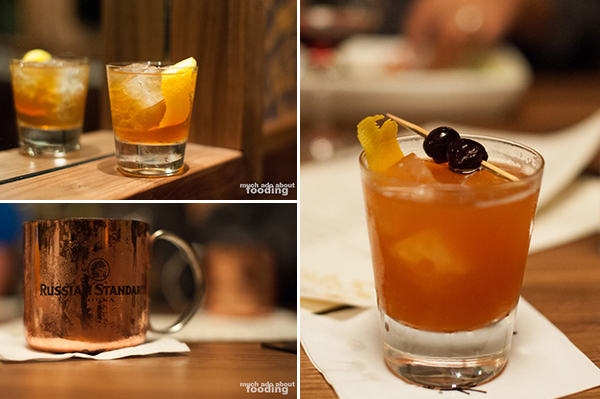 The array of flavor profiles did not cease to be brought forth. Our larger plates, which were still not quite as large as normal-sized servings at the restaurant, carried bolder flavors to our palates. As aforementioned, plenty of the dishes are driven by individual chefs and communities based on where a Lark Creek restaurant is but we did get to try the BBQ Chicken Tamale Pancake (made with matzo dough, avocado salsa, and tortilla chips) which is such a crowd favorite that it is a staple at most restaurants. 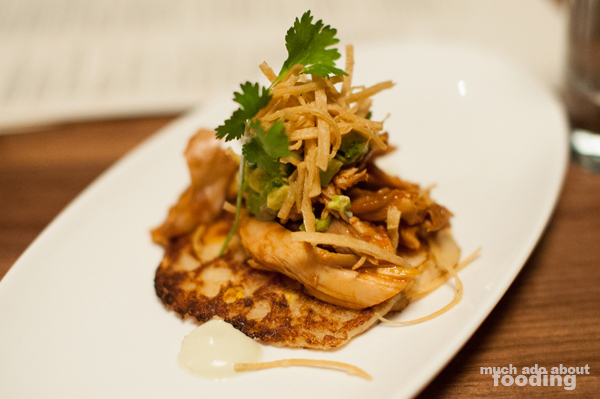 The best description perhaps of this dish was that it seemed a spin on chilaquiles with American influences. The barbecue sauce made it a tad sweeter than we liked but we couldn't think of anything more fitting that a big egg on top to make it a perfect brunch item. Next came a piece of Alaskan Hailbut (with fish fume sauce, black trumpet mushrooms, potato gnocchi, English peas, and pea tendrils) which was very pleasant and clean cut in taste. 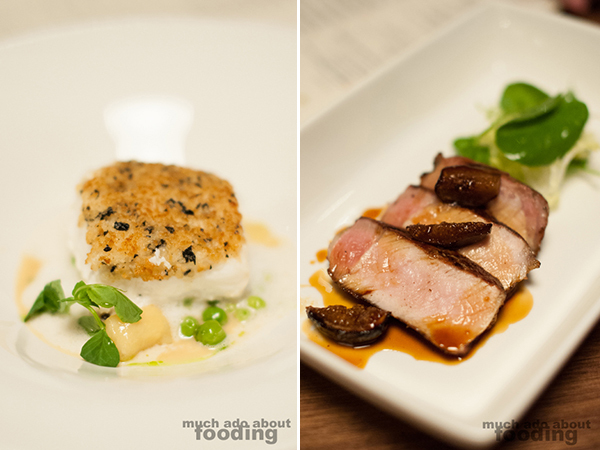 I thoroughly enjoyed the use of mushrooms in this, and the pea tendrils with the peas gave a fresh pop to everything. Their Cider-Brined Pork Chop (roasted black mission figs with their reduction and bourbon sherry glaze) is typically served bone-in and with a more citrus glaze but with figs in season, we got this variation and found that many liked it. It was one of the most tender pieces of pork we've had, almost deceivingly "not" pork. The amount of moistness that Chef was able to maintain makes this a dish worth ordering. Our wine paired with this was 2011 Big Table Farm Pinot Noir. Before we knew it, a parade of desserts were brought out for the entire table just to make sure everyone snagged a bite. 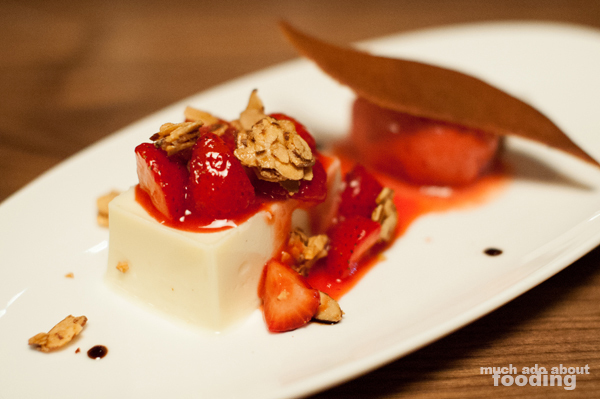 My personal favorite was the White Chocolate Panna Cotta (strawberries, candied almonds, aged balsamic vinegar, and strawberry sorbet) for its subtle sweetness and fresh fruit - I don't have a huge sweet tooth after all. An SPE certified Strawberry Shortcake (Greek yogurt and honey cream) could have fooled anyone about its being well-balanced since it was fairly rich and flavorful. The Lemon Meringue Pie (with blueberry compote) was a table favorite for its tanginess and the well-done compote; a fact about this that many can enjoy is that it can also come in a miniature version in a platter of multiple desserts! 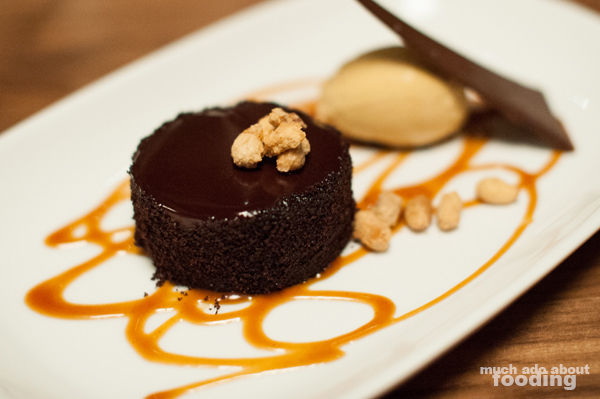 One of the most decadent desserts for the evening was the Valrhona Chocolate Bailey's Cake (caramel chocolate mousse, whiskey glaze, candied peanuts, and salted caramel ice cream) which was still fairly airy anyway. Are they trying to trick us into having light-feeling desserts so we have more or what? 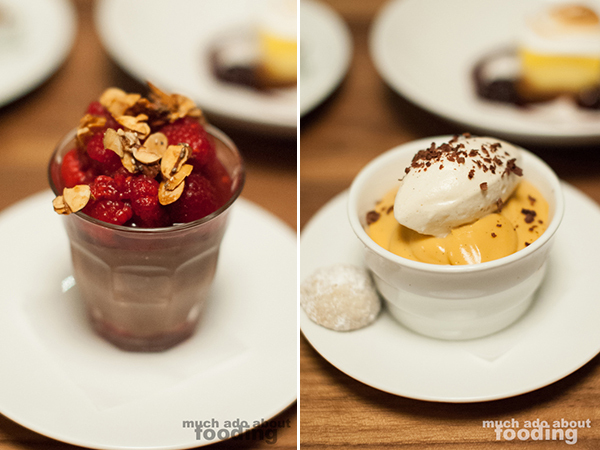 It was hard to pick a favorite from all of these since they touched upon nearly all the aspects that people would search for in a dessert whether it be sweet or savory. Another loved one was the SPE Certified Valrhona Bittersweet Chocolate Raspberry Parfait (72% cacao, almond, date, and chia seed crumble), an elegant cup of chocolate topped with fresh raspberries. The one dessert that is absolutely served at every restaurant was their Signature Butterscotch Pudding (Chantilly cream and wedding cookie) and for good reason! Smooth and creamy, this pudding had to be pulled away from each diner's hands after their spoonful lest it be eaten all up by one person. 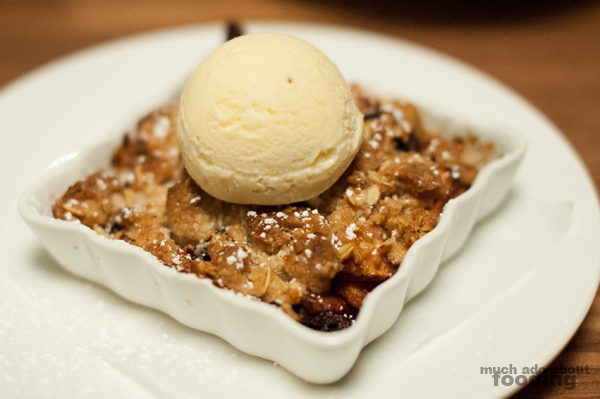 For the homestyle dessert lovers, a warm dish of Apple Blackberry Crisp (oat streusel topping with vanilla bean ice cream) was available and probably was my second favorite of the night but easily could have been number one on a day when I wanted comfort food. The streusel had the right thickness to top the apple blackberry filling underneath, and a scoop of ice cream always does the trick! Thank you to all for having us and to Randy for joining us at dinner. 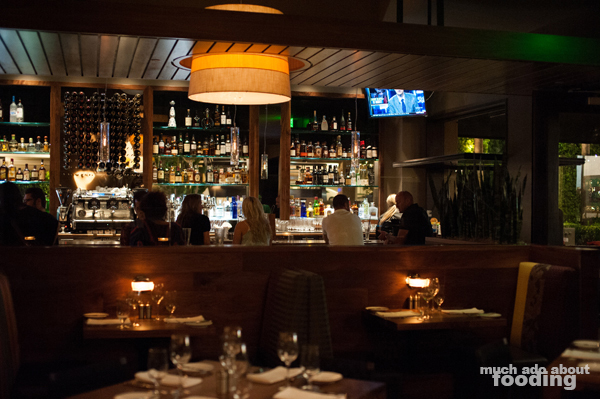 If you're curious about visiting them at 957 Newport Center Dr, Newport Beach, CA 92660, make sure to check out their Happy Hour Mondays through Fridays from 3:00-6:30pm when they feature beers at $4, well drinks at $5, cocktails at $7, and wines on tap at $5 for drinks as well as "4 Dollar Bites," "6 Dollar Bites," and "Bigger Bites & Burgers. " In terms of a regular trip there, the kids' menu (with activity sheet!) 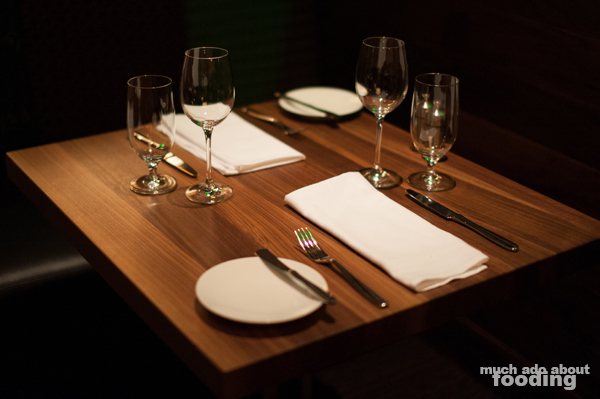 range is about $6-9, brunch menu from $12-$21, lunch menu from $9-$20, and dinner menu from $15-$40. The food here looks delicious. I will have to swing by and try it out.